A police officer has won a discrimination case against her employer, the Devon and Cornwall Police. The incident occurred after she informed them that she was pregnant. Following a risk assessment, she was deemed fit and able to remain in her role with minor adjustments, however it wasn’t long before she found herself moved to an office-based department instead of her usual patrol position. This move was found to be distressing for the pregnant officer, who wanted to continue in her given role. Whilst the she was told it was purely a business decision, the Employment Tribunal disagreed and ruled in her favour. This result highlighted that pregnant women within this industry could be at a disadvantage due to a potentially biased policy. The policy states that if an officer’s performance on duty is reduced for over two weeks, they can be considered for a transfer to a desk role. There are around 36,417 female police officers across the 43 forces across England and Wales, and women make up for around 30 per cent of the nations force. A tweak in this flawed policy would potentially allow for even more gender diversity to blossom within the force – as less females are discouraged from having a career and a family. It’s a tricky topic, granted. After all, the police force can be a potentially dangerous job to be in whilst pregnant. However, the crucial point here is that this woman did not have a choice and her opinion was unfairly dismissed and overlooked. So, what can companies do to ensure they are being fair to their employees who are expecting? Whether it’s in the form of frequent risk assessments throughout the course of the pregnancy, routine catch ups with your employee or even a combination – constant contact and monitoring of the pregnant employee will benefit both parties. Whilst more formal risk assessments are important to the company for liability reasons, a simple conversation around how they are feeling throughout the pregnancy will allow for action to be taken if necessary. Communication is key when life-changing events are taking place. Whilst some women are able to continue work until their maternity leave without adjustments being made, others do need them to ensure the safety and good health of their unborn baby. It’s about knowing the best way to support your staff based on a mutual discussion, rather than just deciding for them. Effective decisions can only be made once both parties have respect and understanding of each other’s circumstances. It’s understandable that the employer needs to think about the business as a whole, and the mother has a world of new responsibilities to consider. But mutual respect is needed in order to make the best decisions for both parties. Whilst the employer may think they are being considerate by changing the employee’s role or responsibilities to reduce stress, it could have the opposite effect. If the individual does not wish for these changes to be made, both respect and trust is lost between the employer and employee. Thus, making future situations difficult – and the last thing you want to do is deter a great member from returning to your company post-pregnancy. 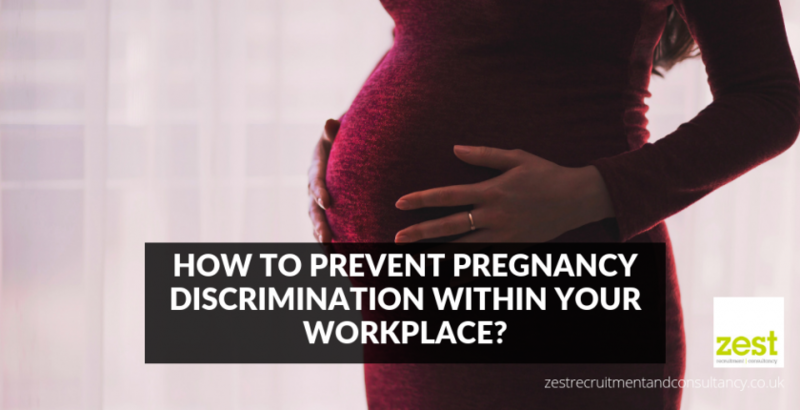 Reducing the possibility of pregnancy discrimination, be that accidental or purposeful, is achievable in whatever industry you are in. It’s understandable that the police force is a more active role that comes with its own risks. But, in the recent discrimination case, it was reported that relevant adjustments were already made to minimise these risks and to control the amount the of physicality needed within the role. It’s unfortunate that in the case of the police officer, a risk assessment was completed but the outcome was ignored. Whilst there was communication, the decision essentially was made for her. This, then contributed to an onset of anxiety and depression, and eventually, the police officer was left no choice but to take sick leave. In this case, the officer came forward and won her case against her employer. But does it really need to get to that point? Ensuring the wellness and safety of your staff should be an absolute priority. Whilst this is a win for expecting mothers across the UK who are passionate about continuing their careers whilst pregnant, it’s a shameful ‘lose’ for the police force. In this day and age your female colleagues should be supported in their life decisions, rather than isolated. Think the police force’s two-week policy is outdated? We’ve written all about outdated laws that are nothing but comical. Take a look at the blog.